After having some lessons with another instructor and stopping for over a year, I was apprehensive about starting lessons again. However, I have really enjoyed my lessons with Kate. 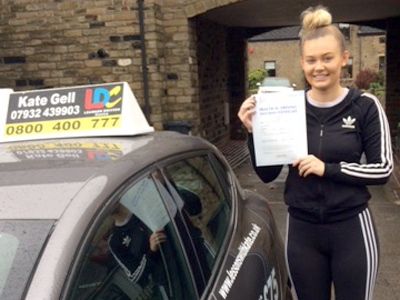 She helped me gain confidence and I felt like I had made progress after each lesson. 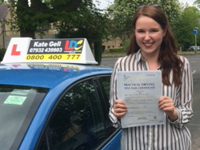 Kate is friendly and approachable with any questions I had throughout my lessons. Thank you Kate! Kate was a great instructor, really patient and calm and explains things clearly. I really enjoyed my lessons and the LDC system works brilliantly! 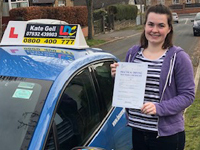 The workbook and DVD's were really helpful to read over before each lesson, Kate was a brilliant instructor, she makes you feel at ease straight away and her guidance is second to none. 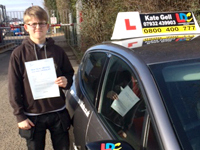 I really enjoyed each lesson and would highly recommend Kate and the LDC system. I came to Kate after having 10 hours with my first instructor and feeling like I wasn't getting anywhere. Kate was recommended to me by my friend and instantly I felt so much more comfortable with her. I couldn't have asked for a better instructor! We got on so well and her coaching methods were clear and thorough! I used the workbook and DVD's but found that the DVD's helped me more as I could visualise it better. 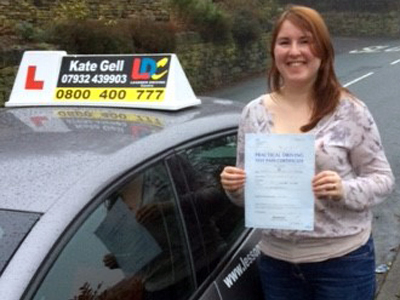 I passed both my theory and practical tests, first time- all thanks to Kate! 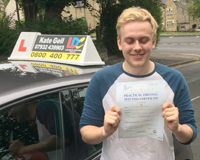 So pleased to have passed! 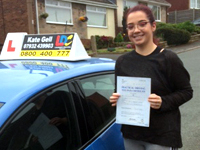 Kate was a great Instructor, made learning really enjoyable, easy to understand and clear. She is very patient and understanding. Would 100% recommend! Woo hoo I've passed first time! 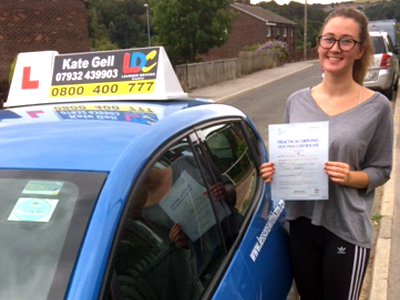 My instructor Kate has been incredibly supportive throughout my learning to drive experience. 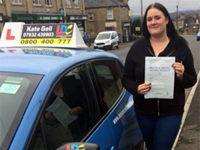 Kate is very reliable and organised and without her i wouldn't have passed first time. The LDC system is useful to read through on a weekly basis so you have an idea what you are doing in the following lesson. I found the DVD's most useful for maneuvers. Delighted with my first time pass!! 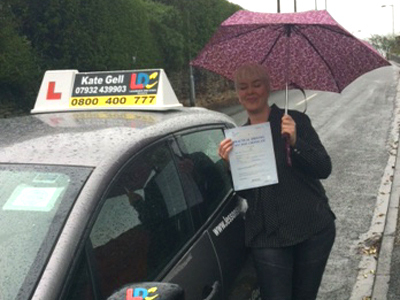 I've been delighted with my LDC Instructor Kate from start to finish. Her expertise and guidance has been fantastic. Always clear and concise, professional, yet makes every lesson a fun learning experience. The LDC system itself has been extremely informative and helpful in guiding me through the course, the workbook and DVD's have been such an added help- reflecting after the lessons, making notes and using the LDC method has ensured a successful test outcome first attempt for me. 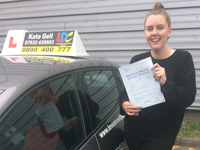 I would definitely recommend Kate and the LDC driving system to anyone. 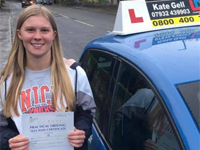 -Thanks for all your hard work and support Kate, I've thoroughly enjoyed your lessons and the whole process of learning such a valuable skill, which will literally be life changing for me. Thank you so much!! Great experience overall, The LDC system combining workbook and DVD's worked well by improving my knowledge and I passed after just 20 hours of lessons. 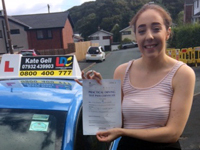 Kate was brilliant- really helpful in working with me to improve my driving in specific areas and knowledge to help and guide me along the way! 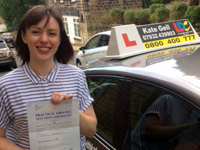 Kate was an excellent Instructor, really calm and encouraging which was exactly what I needed as a nervous driver (initially). The LDC workbook and DVD system have been really helpful for reinforcing learning outside of lessons and helping understanding before trying something new. 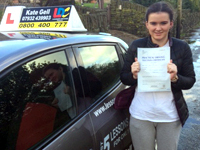 Kate was an amazing Instructor and I would recommend her to anyone starting driving lessons. I really liked the structured workbooks because they have lots of great information about the test and how to practice. Kate provided me with all the tools I needed to pass my driving test with ease. She was clear with Instruction, and her teaching method I perfect; calm, knowledgeable and patient with the student. 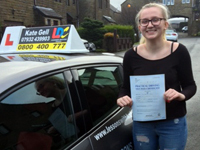 I'd recommend Kate to anyone wanting to pass their driving test, she's a great coach and Instructor. Can't wait to go car shopping! I'd like to thank Kate so much! 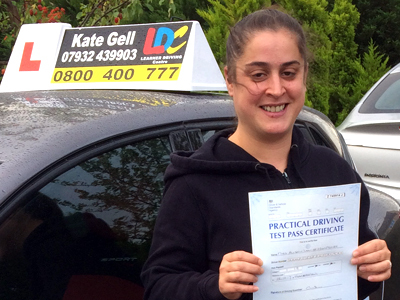 When I've been terrified to get behind the wheel Kate made me feel at ease and really helped build my confidence. I would definitely recommend her and already have done! The LDC learning system workbook and DVD's were great and helped a lot throughout my lessons and in preparing for my test. Thank you Kate!! I swapped Instructors after 3 months of driving as I just felt like I wasn't progressing and if anything going backwards. I thought it was me! Kate has been AMAZING! I've rally enjoyed my driving with Kate, she built up my confidence immediately! 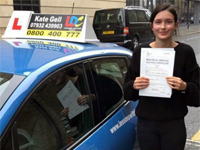 The LDC learning system workbook and DVD's have been incredibly helpful- and I'd recommend Kate to absolutely everybody- I think a first time pass shows it! I feel she really helped me with my own worries, and worked for me as an individual and doesn't just stay by the book. So happy to pass as my car's been waiting on the drive! 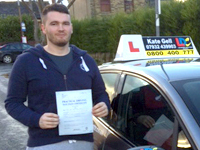 Really enjoyed my lessons with Kate following changing from another instructor I wasn't making progress with. Kate's a great Instructor, would highly recommend. I can finally do the school run for my 4 kids by car!! Kate was brilliant she gave me all the confidence to do it, I really can't thank her enough! I had a string of 7 fails 20 years ago and it destroyed my confidence and I gave up. My sister in law recommended Kate and we met up in June and discussed all the options and decided a one week pass course would be best once the kids were back at school as I am non stop with them. The LDC learning is really good - the workbook and DVD's came as part of the course and I found them really helpful and easy to understand. 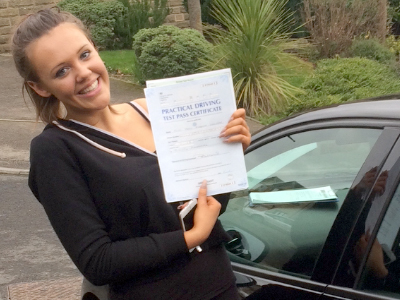 I can't believe I've passed and can finally do the school run by car! Kate as an Instructor was fantastic. She gave clear instruction and guidance. Instruction was delivered calmly and allowed me to settle. I wouldn't have passed Intensively if not for Kate's tuition. 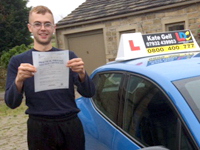 The LDC Learning system workbook and DVD's were a valuable tool that allowed me to be confident while driving as it meant that I already had knowledge of subjects covered and the manoeuvres before beginning my Intensive Course. My theory was already passed before the course. I did a 20 hour midway course with Kate following 23 hours with LDC Instructor Cath Crowther. I would recommenced Kate of LDC to anyone, as she is very friendly and supportive and helped with anything I struggled with. The LDC training system is great at explaining in detail every aspect of driving along with the workbook that describes every part of the lessons I had. 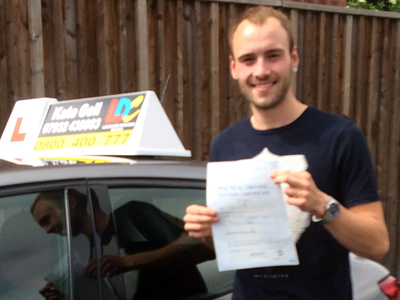 I found the whole experience very informative, which prepared me for the standard of driving the test centre expects. overall it's been a brilliant experience and I am so pleased to have passed! 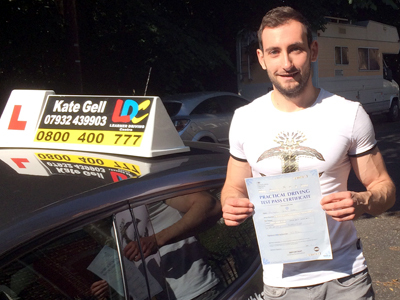 I did the 30 hour semi-Intensive course with the LDC Learning System-workbook plus theory and practical test DVD's. I found the theory work very helpful compared to other resources available, enabling me to get 50/50 and 65/75 on my test. The Instructional practical DVD's were very useful and informative and used alongside with the workbook complemented the lessons perfectly, saving time and making the lesson more comfortable for me I felt. Kate was a very good Instructor who explained all aspects of the lessons thoroughly and provided clear answers to any of the questions I might have had. Having only had a few hours of lessons 8 years previously I could tell the difference straight away in the level of training.